Track Tac Chili Oil is polymeric, exhibiting very low compressibility. It should not be used during "break in" of an engine or the seating of rings. Track Tac Chili Oil is used only after an engine is broken in. If this isn't done there will be a seating problem. Chili Oil has an extremely low addition level. As little as 1mm per 12 to 14 oz of oil can be used. Chili Oil does not cause carbon build up. Track Tac Chili Oil is a true oil with a value roughly equivalent to 100 weight oil. Track Tac Chili Oil should never be used in a 2 cycle (2 stroke) engine. 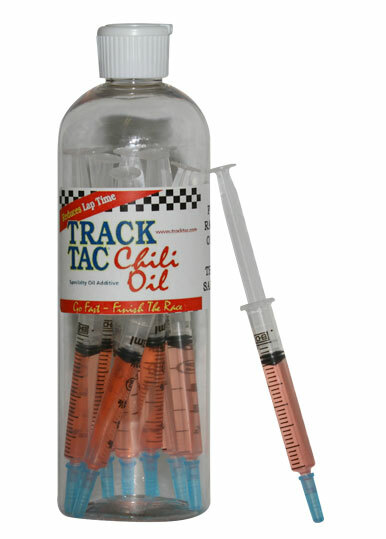 Add one syringe full (2.5mm) of Track Tac Chili Oil to a per-measured container of oil for a single oil change. Shake the container vigorously to mix the dispersion of Track Tac Chili Oil uniformly through the oil. If the dispersion is not added to the crankcase immediately then re-shake the mixture immediately prior to the addition to the crankcase. On a dynamometer the peak torque should be reached 300 to 500 RPM's quicker than without the Track Tac Chili Oil. The peak horsepower should be reached at 300 to 500 RPM's higher. The increase in peak torque and horsepower may be significant. There should be a drop in engine temperature by 20?F to 40?F because of reduced friction. The oil should be cloudy after shaking. At this time there are no rules in any organization against the use of this oil (circa Jan 1, 2008).